On Feb 12, 2018 I started taking one snapshot of the Holyoke Dam with my phone every day that I was in town. I started in February just because I am not good at starting new habits in January. I missed about three week’s worth of photos in 2018 because I was traveling. And I missed two days just because I forgot to go get a picture. The bridge over the Connecticut River where I took the photos is a place on my regular walking route. It’s also on my way to the studio, so on days that I drive to work I can easily pull over for a shot. My family knows that we have to budget in a couple of extra minutes so that we can stop and take “A Dam Photo” before starting our weekend adventures. It turned out to be an unexpected surprise how much I loved watching the river rise and fall throughout the year. Seeing Great Blue Herons as they wade and Bald Eagles in the trees are an added bonus, but are hard to photograph with my phone. It is really windy on the bridge. Below is a video of most of 2018. If you want to get to the good stuff, scroll through to a minute in when the trees start to green up in the spring. Barnyard quilts by Timna Tarr at the South Hadley, MA Public Library December 3-29, 2018. I met Ann Feitelson more than 15 years ago through a guild Round Robin. Ann is a master colorist, painter, and she literally wrote the book on Fair Isle knitting. Over the years we have consulted each other during the design and construction of our quilts. I know her skills and color-sense have influenced my work. Ann and I work very differently. I make as many quilt blocks as I need and gosh-darnit I will make them all work together. Ann makes many, many more blocks than she needs and looks for exactly the right block for the right location. As a result, she has piles of leftovers when she finishes a quilt. She then passed her leftovers on to me to play with. I came up with this version of the baskets which became our Accidental Round Robin quilt #1. It's small, just 36" x 40". Ann did all of the hard work of cutting the fabric and precisely piecing these 4" blocks. I had the fun part of organizing the blocks and messing with the color placement and I think Ann enjoyed seeing what I would do with her blocks. 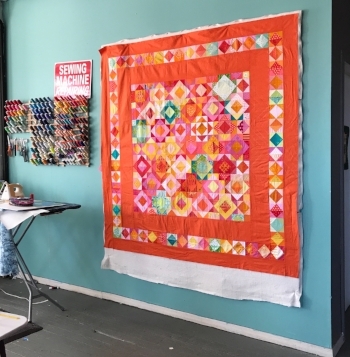 Ann recently finished another stunner of a quilt, Flying Carrots (84" x 62"). Flying Carrots is entirely made up of flying geese - about 600 of them. I do not enjoy making flying geese, so I avoid them when I can. But when Ann handed me a big box of 300 leftover geese I was thrilled to play with them. Instead of having the blocks read as traditional geese I rotated them to create diamonds. 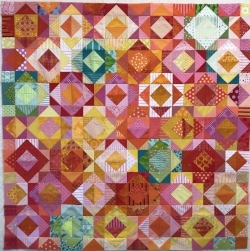 This quilt was challenging in terms of color because there were so few green blocks to cool off all of the hot pinks and oranges. To compensate, I spread the greens out throughout the quilt. This 44"x44" top went back to Ann a few weeks ago. She wanted to make it bigger so that she could gift it to a friend (and have it actually be useful). Now it has borders! Accidental Round Robin #2 is 72"x72" and is now hanging on my design wall waiting to be quilted. What makes this collaboration work is that there are no expectations between us, it's all an experiment. It wouldn't work if we didn't trust each other's design sense, or if we became too attached to our individual pieces of the puzzle. I'm guessing that Ann wishes I was a more precise piecer, but she's happy to pass the task of quilting on to me so it all works out in the end. Please join me at the Gaylord Memorial Library Thursday, December 13 from 6-8pm for our monthly Sit and Stitch. It's a great time to relax, chat, stitch, or just hang out. P.S. Registration is now open for my Mosaic Quilting class at Snow Farm in Williamsburg, MA. This three-day workshop over Labor Day weekend will give you all the tips you need to make a photorealistic quilt, like those in my Barnyard series. I'm excited to share all I've learned while making the animals. November 1 marks one year since I moved into a studio space and stopped working out of my house. I often get asked if I am more productive now that I have to actually go to work. The short answer is no, I really enjoy working from home and getting stuff done was never a problem. What has changed is that I now do my work in larger chunks of time. While I'm in the studio I am only working, I am not tempted to prep dinner or to start a load of laundry while I wait for my iron to heat up. One big change is that I used to be a "start a quilt and finish the quilt" kind of person. Now that I have room to spread out I am working on more than one quilt at a time. The jury is still out on whether that is a positive or negative development. Of course there are cons to having a separate studio space but those are usually due to my own organizational lapses. I cannot tell you how many times I've brought a quilt home for some evening hand-stitching and left the thread at the studio. Even though the studio is only a mile away, after I am home I really do not want to go back out to retrieve the thread. That's when I am good at deciding that the stitching can wait until tomorrow! Four of my quilts are at the International Quilt Festival in Houston, TX this week. That is one of my favorite places to be and I am bummed I couldn't make it this year. I hope all of you who are going get to see fabulous things. 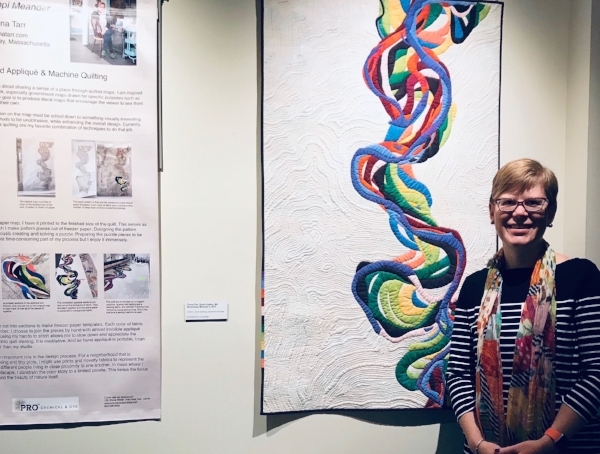 Mississippi Meander II is at the New England Quilt Museum as part of the SAQA Explorations exhibit through December 30. December 3-29 The Barnyard Series will be in my hometown at the South Hadley Public Library. Stop in and say hi to the animals, I am looking forward to seeing 6 (or maybe 7 if I finish another one) hung together. 2019 promises to be a busy and fun year. I already have trips planned to Nashville, Denver, Kansas City (twice! ), Maine, New Hampshire, Washington DC, New York, and New Jersey. Stay tuned for more details as they come together. Last week I went on vacation with my family. We road-tripped to several cities, saw natural wonders and wonderful theater, ate good food, and I did not sew at all. It was a great respite. Even though I feel a bit rusty this week I am happy to be back quilting. In August there is an exhibit of my work at the Barney Library in Farmington, CT. Included in the show will be my recent Barnyard series. Please join me on Saturday August 4, from 1-3pm for the reception. The show is also open during regular library hours. Since I am prepping for the show, I have been sewing on a lot of bindings. You may or may not know that I like to sew fast. The downside of my lead foot is that sometimes my bindings can get a little wobbly. My new hack for getting my bindings on straight is to sew the binding strip on twice. The first time around I attach the binding strip to the quilt. The second pass straightens out any places where I sewed unevenly the first time around. Now I know you all are thinking, "If you just slowed down, you wouldn't need to do it twice." That would be the prudent way to do things, but I have found that I enjoy doing the second round of stitching. It gives me a chance to double check the binding and I find that the binding feels more stable with the additional stitching. Even though it is only July, I want to let you all know that I will be teaching a couple of ongoing open-studio classes in the fall. I'll be at the Holyoke Creative Arts Center in Holyoke, MA on Tuesday mornings, and at the Hill Institute in Florence, MA Tuesday evenings and Wednesday afternoons. Registration is not yet open for either location, but please let me know if you have any questions about these programs. 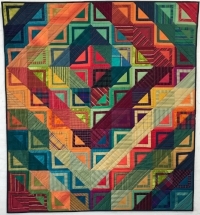 At a recent meeting, the Northampton Modern Quilt Guild discussed working in a series. I said that I never think I'm going to work in a series, but I always end up doing so. It's always a surprise to me when I end up making a collection. Creating one quilt draws out "what if?" questions that pique my curiosity and then I have to see what happens. Last spring I took photos of my friend's chickens, Bonnie and Princess. This spring they became a quilt called "Clucking Awesome: Bonnie and Princess." While working on the hens, I wondered what would happen if I simplified the design? This led me to look for a photo of a pig from my December Bahamas trip. In the quilt, I eliminated the fence that bisected her face, and put her on a green background. (This quilt still needs a name, any suggestions??) The sow led to the question, "what if I take an animal and put her on a vibrant colored background?" Now I have a cow-in-progress. Without planning on it, I have a barnyard series of 38"x38" quilts! They will all hang together at my show at the Barney Library in Farmington, CT August, 2-29. 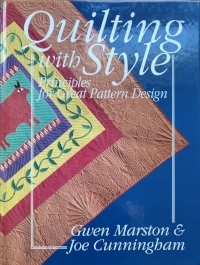 I know I am about 25 years late to the party, but I just finished reading Quilting with Style by Gwen Marston and Joe Cunningham. It's an excellent primer on designing quilting patterns. Even though it doesn't mention machine quilting, the design principles for hand and machine quilting are the same regardless of your preferred technique.